Janet Fielding was born in Brisbane, Australia, in 1953 as Janet Mahoney. She graduated from the University of Queensland, in Brisbane, with an Arts Degree in Drama. It is here where she first took up acting. After leaving university she worked with an English writer/director named Albert Hunt, who in 1977 brought her to England in one of his shows. Once in England she joined Ken Campbell at the Science Fiction Theatre of Liverpool and appeared in productions including The Warp and The End is Nigh. Following this she won a small part in an episode of the 1980 Hammer House of Horror series. It was then that she was cast as Tegan playing the part between 1981 and 1984. After leaving the show she appeared in the film Murphy's Mob as well as in a 1984 episode of Minder on television and also in a theatre production of The Collector and the pantomime Aladdin. In 1991 she gave up acting to work as an administrator, in the pressure group Women in Film and Television, before becoming a director of Marina Martin Associates, an actor's agency, representing amongst others the Eighth Doctor, Paul McGann. An Austrialian air hostess, Tegan Jovanka’s first day of work was cut short before it even started when she wandered into the TARDIS, having mistaken it for a normal police box and seeking a phone to call for assistance after her Aunt Vanessa’s car broke down ("Logopolis"). Despite lacking a full understanding of the situation she found herself in when the Fourth Doctor and Adric accidentally took her to Logopolis without realising it - she had wandered deeper into the TARDIS while they were otherwise occupied in another part of the ship -, she nevertheless stood by The Doctor after The Master’s actions on Logopolis threatened the universe by preventing the Logopolitans transmitting a signal that would drain entropy out of this universe, travelling with The Doctor and The Master - who she had recently learned had murdered Vanessa - to Earth’s Pharos Project, The Doctor planning to use the radio dish to transmit the Logopolitan program. Although the plan succeeded, The Doctor was subsequently forced to regenerate after he fell from the dish due to The Master’s actions, leaving Tegan and her fellow companions Adric and Nyssa to take him back to the TARDIS and depart, leaving Tegan unable to return home due to the Fifth Doctor’s initially poor skills at piloting the ship (In contrast to the skill his fourth self had displayed towards the end of his life). Although she was born and raised in Australia, Tegan was sent to live with her Aunt Vanessa in England when she was fifteen after she ran away from boarding school ("The King of Terror"), although her relationship with her father was apparently a close one despite him once having an affair, Tegan remembering her father as the one who inspired her to seek her air hostess job and feeling great regret when she thought her father had died before she could return home (Although this was later revealed to be an illusion created by The Toymaker to turn her against The Doctor) ("Divided Loyalties"). Her upbringing left her with a strong sense of self and an equally powerful will, Tegan regularly confronting The Doctor during her initial time in the TARDIS, including telling him - when frustrated about his inability to take her home - that, for a Time Lord, a broken watch kept better time than him (Reasoning that it was at least accurate twice a day) ("The Visitation"). Although she often vocally objected to some of The Doctor’s actions during her travels with him, ranging from his decision to allow Kamelion to accompany them ("The King’s Demons") to his apparent unwillingness to take action against the ruthless Monarch’s plans for Earth ("Four to Doomsday"), and had to endure such traumatic occasions as being used as a vessel for the disembodied intelligence known as the Mara to enter the real world ("Kinda"), Tegan nevertheless genuinely seemed to enjoy her time with The Doctor, particularly enjoying the party they attended at Cranleigh Hall after The Doctor single-handedly won a cricket match in the grounds ("Black Orchid"). During her initial travels, she was somewhat uncomfortable at being the only human in the four-person TARDIS crew - The Doctor being a Time Lord, Adric an Alzarian and Nyssa a Trakenite -, although she only specifically disliked Adric due to his air of arrogance and superiority, and even this mellowed over time. Although sometimes uncomfortable about the rapport that existed between The Doctor and Nyssa, Tegan nevertheless came to see Nyssa as a sister of sorts, even talking about the possibility of having a birthday party for her before her first departure from the TARDIS crew, with Nyssa admitting that she had missed Tegan when they were reunited. Tegan was particularly notable as a companion from the classic series in that she actually left The Doctor twice, The Doctor and Nyssa first parting company with her after thwarting The Master’s plan to control the power of the Xeraphim ("Time-Flight") (Although this was only a misunderstanding; having arrived at Heathrow Airport after Tegan’s constant request to return there, The Doctor assumed that Tegan would want to leave them, with Tegan making up her mind just seconds too late to catch up with The Doctor before he departed). She resumed her original job as an air stewardess, but was soon sacked when she hit a passenger who was waiting by the door rather than in his seat as the plane landed, receiving three months' pay as part of her severance package ("The Waters of Amsterdam"). Tegan spent the next three months dating Kyle, another passenger on her final flight who had tried to help her, but she eventually broke up with him as she felt that he never really challenged her on anything. Paying a visit to her cousin Colin as he went backpacking through Amsterdam, Tegan was abducted by The Doctor's old enemy Omega to be used as a hostage against The Doctor ("Arc of Infinity") while Omega sought to use his body to return to the matter universe. Despite a brief delay when Kyle was revealed to be an android created as part of an elaborate plan to lure a time-traveller to Amsterdam in the sixteenth century ("The Waters of Amsterdam"), followed by The Doctor being temporarily called away on a mission for the Time Lords ("Omega"), Tegan swiftly decided to rejoin The Doctor and Nyssa in the TARDIS. Although her reunion was initially revealed to be partly the result of the Mara attempting to use Tegan as a host to regenerate itself back on its home planet ("Snakedance"), The Doctor was able to purge the Mara from Tegan before it could regain an independent physical form, although Tegan took some time to fully recover from the trauma of what had happened to her. Although her time with The Doctor proved difficult on more than one occasion, Tegan nevertheless was grateful for the chance to travel with him again, reflecting that what she missed most about her time with The Doctor was the ability to make a difference in the lives of others ("Fear of the Dark"). Her second period of travel with The Doctor proved far more dramatic than the first, The Doctor swiftly finding himself pitted against the power of The Black Guardian - the personification of Chaos - as The Black Guardian attempt to use The Doctor’s new companion Turlough as his assassin, ordering Turlough to kill The Doctor ("Mawdryn Undead"). Although Turlough was finally able to free himself from the control of The Black Guardian ("Enlightenment"), the relationship between him and Tegan remained tense even after The Doctor assured Tegan that he trusted Turlough, Tegan’s relationship with The Doctor souring further when he allowed Kamelion - a shape-shifting android who had been previously used by The Master as a weapon - to accompany them ("The King’s Demons"). Despite the occasional animosity between The Doctor and Tegan at this time, however, Tegan continued to enjoy her time in the TARDIS, and The Doctor seemed to reciprocate this appreciation, taking two trips on Tegan’s request, allowing her to see Earth’s future ("Warriors of the Deep") and make a brief visit to her grandfather ("The Awakening"). During this time she even met fellow past companions The Brigadier, Susan and Sarah Jane Smith during the Death Zone crisis when The Doctor’s earlier selves were drawn out of their proper places in time, Tegan travelling across the Death Zone - a location on Gallifrey where early Time Lords had placed various species in combat for their own amusement - with the First Doctor while the Fifth investigated the conspiracy in the High Council that had drawn his past selves there in the first place. Tegan eventually left The Doctor after a particularly brutal confrontation with the Daleks on contemporary Earth, where The Doctor was forced to destroy the Dalek forces with a virus after the soldiers who had been aiding The Doctor in fighting the Daleks were all killed; although Tegan acknowledged that The Doctor hadn’t wanted any of this death, she felt that it as time to follow her Aunt Vanessa’s advice and stop doing something that had stopped being fun. Although affected by her departure, The Doctor recognised that Tegan had needed to move on, commenting to Turlough as they departed that he had left Gallifrey for similar reasons. Her life after leaving The Doctor was initially revealed by only brief glimpses, the most notable detail being her marriage to rockstar Johnny Chester - coincidentally the son of the First Doctor’s old companions Barbara Wright and Ian Chesterton -, which later ended in divorce. 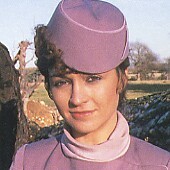 Tegan’s post-Doctor life was seen in greater detail in "The Gathering", when the Fifth Doctor unintentionally made contact with her in 2006 (Currently alone as his current companions were attending to business in Monte Carlo) while investigating strange occurrences at Chambers Pharmaceuticals, a company involved in medical research; Katherine Chambers, the head of the company, was a friend of Tegan’s. During this meeting, it was revealed that Tegan had taken over her father’s company in Brisbane after her departure from the TARDIS, but had so completely committed herself to the company that she had no real friends or family left outside of her immediate colleagues… and, even worse, she was dying of an inoperable brain tumour, apparently caused by her exposure to alien technology. During a brief argument with Tegan’s ex-boyfriend, Michael, while attempting to rescue Tegan from Catherine - who was attempting to use Cyber-technology as a treatment for disease -, Michael revealed his belief that Tegan had been in love with The Doctor, suggesting that she threw herself into her work to get over the pain of leaving him. Despite her tumour, however, Tegan refused The Doctor’s offer to examine her, saying that she’d enjoyed having a normal life, and assuring him that she wasn’t in love with him, but she had enjoyed her time with him and had learned from their time together to appreciate the smaller wonders of life. In "Death of The Doctor" - an episode of spin-off series The Sarah Jane Adventures, looking at the modern adventures of the Third and Fourth Doctor’s companion Sarah Jane Smith -, Sarah Jane mentioned that her research into other companions had included reference to Tegan working for aboriginal rights in Australia, suggesting that the tumour was either treated or had at least gone into remission to an extent that allowed her to take a more active role in the world.